Nic Harrison porcelain bowl - 5⅜" (136 mm) diameter, 2¾" (69 mm) high. Nic Harrison, born 1949, studied ceramics at Cornwall College under Bill Marshall. At the end of his course, in 1979, he went to the Leach Pottery to continue his studies. It was the year that Bernard Leach died and Nic was the last student to join the pottery. He was a keen member of the Leach team and became proficient in making standard ware. He absorbed the influence of the great potters who had previously worked there and studied their work assiduously. In 1981 he started his own pottery at Trelowarren, Cornwall, and has worked there since. He makes stoneware pots, decorative and functional, and has carried on the Leach tradition with his large range of standard ware. 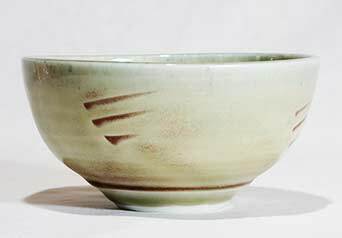 He favours celadon and tenmoku glazes fired in a reduced atmosphere.